Many of you will be receiving your veg box to grow kits this week and next. They come with full instructions of what to do to look after the plants, how to plant them and how to sow the seeds. Follow this advice carefully to get the best results – however here are some tips to help you grow. Here are my tips and some pictures from planting our vegbox to grow outside the Riverford Field Kitchen this week, if you are ever passing feel free to pop by and see how our veg patch is growing. As soon as you get the chance, open the box and unpack the plants. Lay them out somewhere sheltered and in a sunny area. 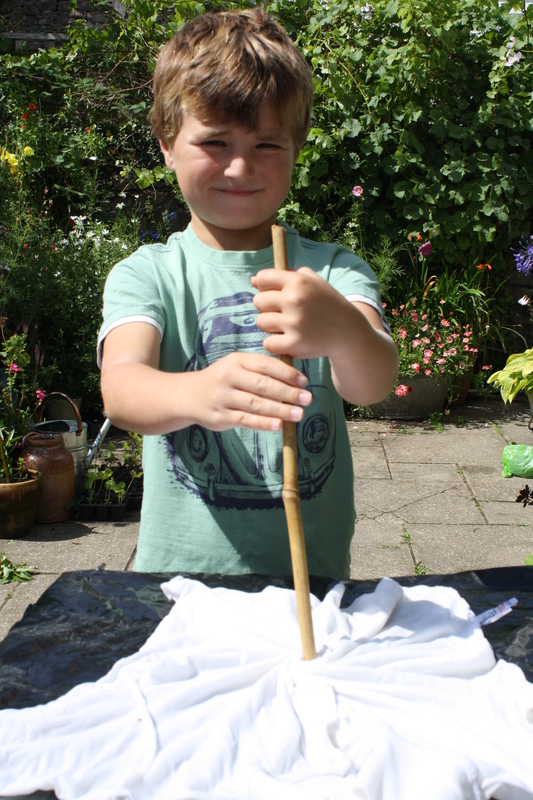 Put the seeds somewhere dry and cool until you are ready to sow them. Open the seed potatoes and put them somewhere dry and protected from cold weather and expose them to light to encourage the chits to grow. If any plants look a bit loose after the journey, gently firm them into the module. They will more than likely need a light watering. Leave the plants to acclimatize and recover from the journey for a day or two before planting. The plants will be fine left unplanted for a week or so if you are not ready but make sure to check them regularly and water them if the compost is looking at all dry. It is important to choose a site that gets plenty of sunlight for successful growing. It’s also important to prepare the soil as well as possible. Hopefully you will have followed the guidance in the box booklet on preparing the ground and will already have adding well rotted farmyard manure, horse dung or chicken pellets. If you have done this you are ready to get planting. If not, dig in some organic chicken pellets before planting. Follow the suggested spacing for the seedlings and sowings, remembering to leave enough room to get in between the rows for watering, weeding and cropping later on. Whilst planting it’s useful to have a stake or label next to where you have planted your veg to help you identify it later on. 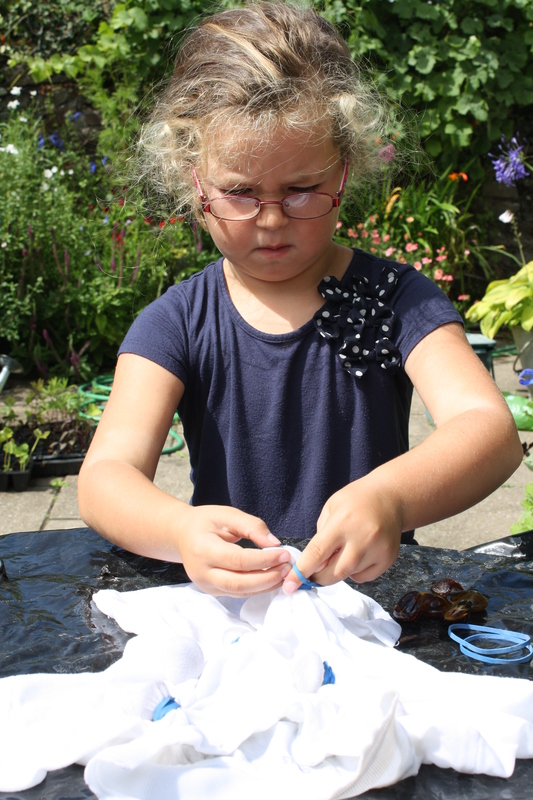 Once planted, make sure to water in the plants and check regularly for slugs and snails. Organic slug pellets are useful, but there are many other ways of dealing with these pests. Look on the internet for tips on organic pest control. Covering your planted up area with fleece will help give your plants a head start, creating a microclimate, and will protect the plants from cold and wind. This should be removed regularly to check for said pests and for weeding and hoeing. 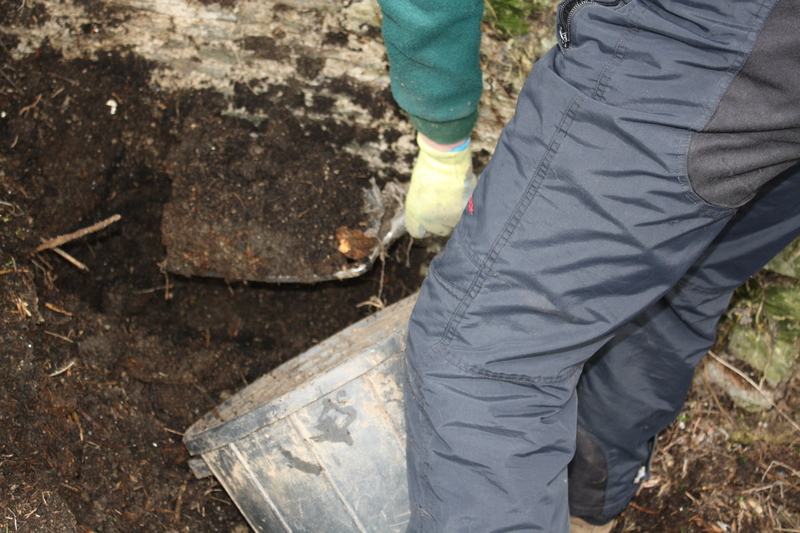 Then you can pull the fleece back over the area, anchoring it with stones or sacks filled with earth. 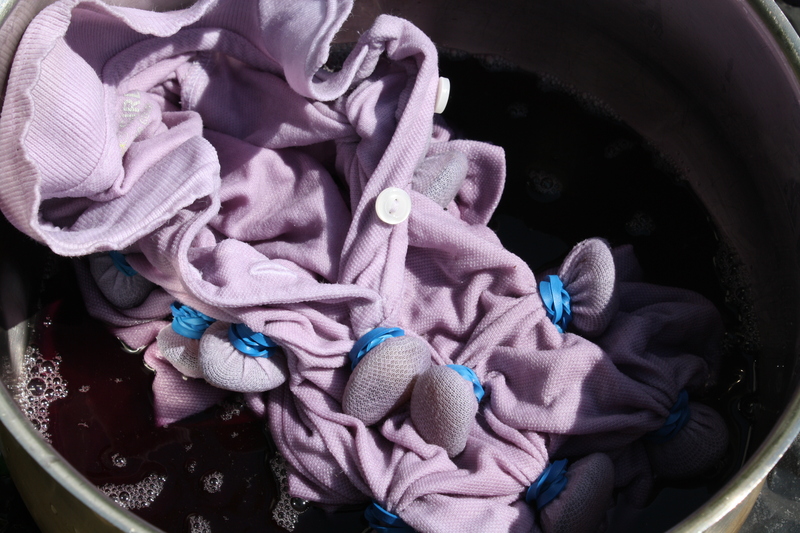 Once the weather warms up and the plants have shown signs of growing on, you can remove the fleece and store for further use in the future. This spring is particularly cold and shows no signs of letting up, so be careful to put the tomatoes, courgettes, squash and coriander in an area protected from frosts and wind , e.g. ; a greenhouse, polytunnel, conservatory or on a light window sill, at least. 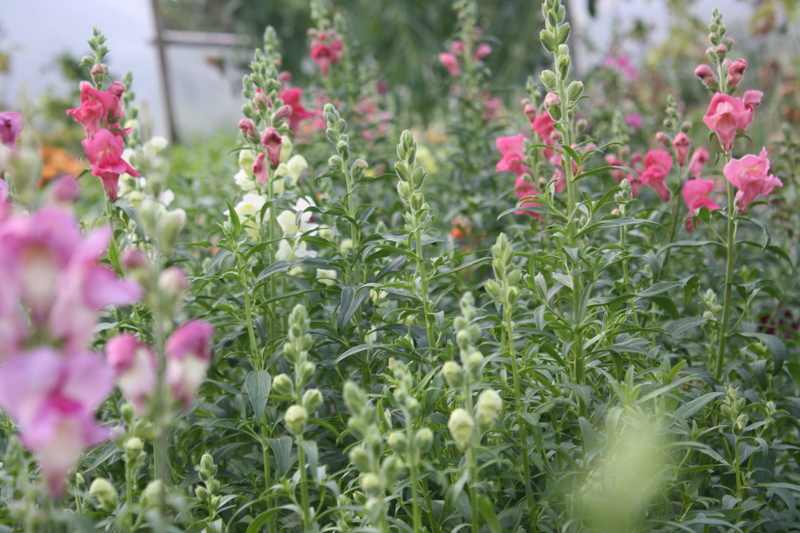 Grow these tender plants on, repotting if necessary until the risk of frosts and cold wind is over. Only then, should you plant them outside. Look at using cloches for protection once planted. Please make use of me for any questions you may have or for problems you are facing – either comment on this blog or tweet us @riverford. I am happy to help and wish you much success. Spring is finally here and although it has been rather wet and cold, we are now approaching the busiest time of year in the garden. Feed your soil: The most important task in any garden, be it a vegetable garden, herb garden, ornamental, cutting or even a container garden, is to look after the soil. I am totally insistent on composting in all the gardens I work in, mostly for this very reason, but also as it provides an area to recycle waste from your garden in the form of your lawn clippings, weeds, leaves, some paper and cardboard too, plus kitchen waste such as veg and fruit peelings and puts it all to really good use. All this, if managed properly, will make great compost to feed your garden with and improve the structure and fertility of your soil. I won’t bore you too much as I have already written a blog about composting (see here), but if you are keen to start composting, or want to improve your techniques this link will help you gain more knowledge. I have known Nicky Scott for about thirty years, around here he is renowned as being the ‘Devon Composting Guru.’ He is also an accomplished musician and I remember being very impressed when I noticed a large sticker on his guitar case promoting composting. This is my kinda guy! Weeding: If you already have a compost heap, this is the time of year to empty it out and feed your soil with it. 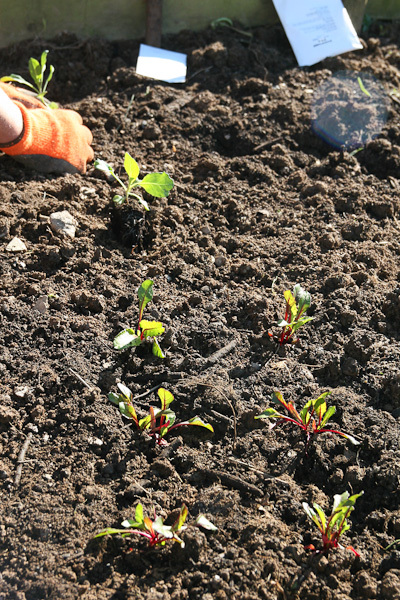 Before spreading your compost, it is essential to thoroughly weed your beds, digging out any perennial weeds. Dig between existing plants looking carefully for weeds, such as bindweed, buttercup, couch grass and nightmare of nightmare, the worst of all, in my eyes…. the dreaded ground elder. I have some appearing in various areas of my garden and am slightly obsessive about weeding it out. Once it gets a hold you are done for. Time to sell the house and move elsewhere! I spent a couple of hours digging it out, lifting clumps of perennials and teasing it out. If you are growing veg this year you need to prepare the ground. Some of you have ordered our veg, herb or flower grow your own kits to kick start the season. If you are still thinking about it, hurry, do not procrastinate and avoid disappointment as we have limited numbers. The veg box to grow starts being delivered on the 21st April, so now is the time to get busy. Feeding the soil is key to your success in growing anything. 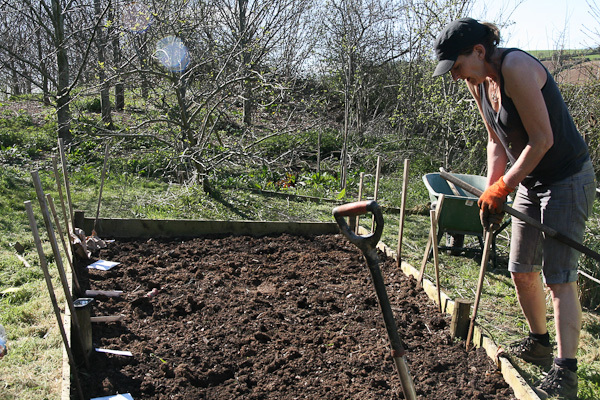 Weed your beds and apply compost from your heaps and for extra fertility, some well rotted organic farmyard manure. This is particularly important to growing veg and should be spread a few weeks before planting and sowing. Chicken pellets can also be used. If you’d like to ask me any questions, comment here and I’ll get back to you. In my next blog I’ll be sharing tips on how to divide perennial clumps and what to plant now for summer flowering, check back here or look out for news on our social media. Follow us: Facebook, Twitter, Pinterest, Google+, Instagram. Snow drops are flowering; daffs are starting to push up through the sodden earth. Signs of spring are here and it’s really not long before we can start to get busy in our gardens. If only it would stop raining! Just as we think the ground is finally starting to dry out we get another shower or downpour. Growing your own is not just about producing food/flowers etc. It gets you outside. You are learning new skills. Breathing in fresh air and getting some exercise. 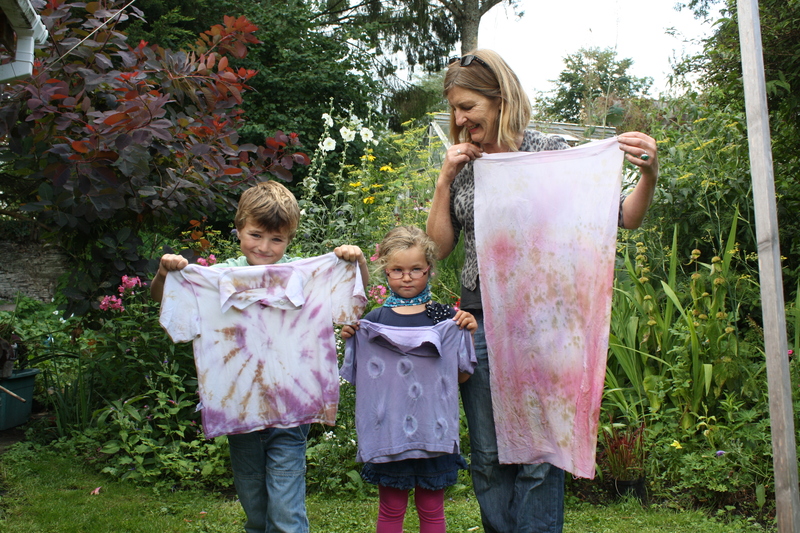 You can educate your children about growing and also about the insects, birds and small mammals that live in our gardens and are very much part of the whole picture. Growing your own is a brilliant way to connect with the earth that we live on. Communing with nature! That may sound a bit hippy but it really is true! 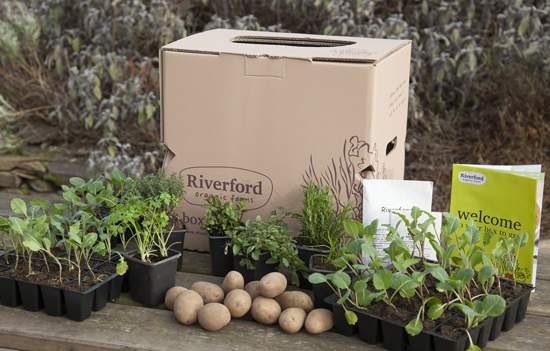 Riverford’s Boxes to grow are now available to order and come in all shapes and sizes. You don’t even need a garden to grow them in. The small veg box to grow and the herb boxes to grow are ideal for people with a patio or balcony and it is amazing what you can produce in pots, tubs, old buckets, boxes. Even old veg boxes make a great container! We have put together large and small veg kits, two sizes of herb kits and an amazing flower box to grow too – the idea is that when your box arrives, you follow the preparation guidelines on the website and dig/weed your plot, spread well rotted manure etc and await the arrival of your kit with excitement! The veg and flower kits consist of plants, seedlings, seeds and full instructions and guidance on what to do and how to do it. The contents of the veg and herb boxes to grow are carefully selected by our knowledgeable team here at Riverford, putting into a box our years of experience of growing fantastic tasting vegetables. We pick varieties that are full of flavour and disease resistant that more often than not, we ourselves use here on the farm. The plants and seeds for the flower box to grow are all selected by me. 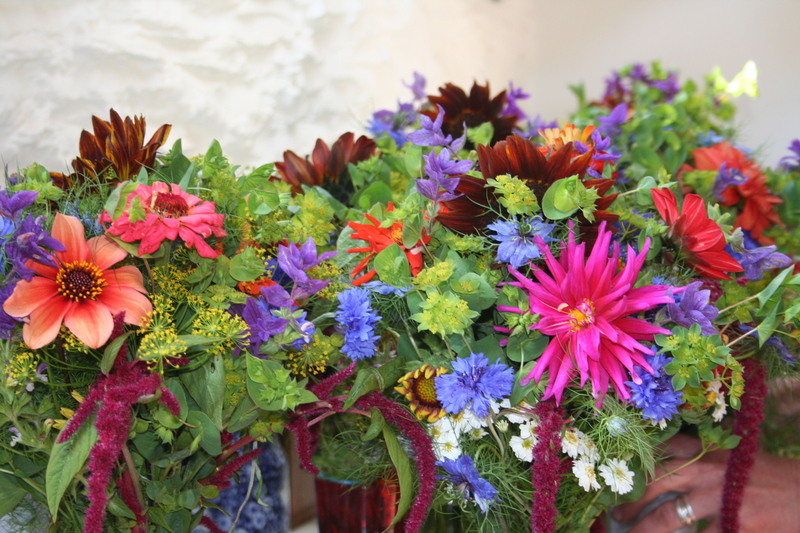 I have been growing cut flowers for a long time and have plenty of experience in this area. 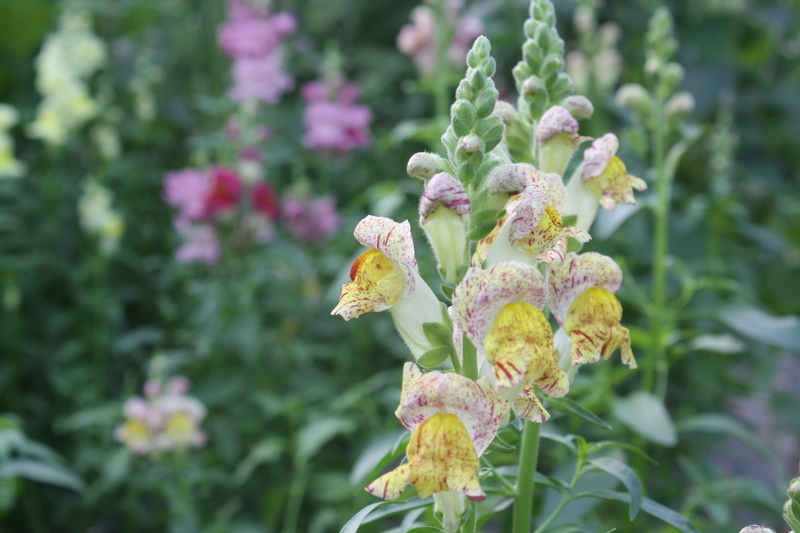 The varieties I have selected are easy to grow and a good range of colours and will provide you with traditional country flowers to cut for your house and enough to give to friends too, for several months. The herb boxes to grow consist of a selection of useful culinary herbs which will grow on and give you herbs for your kitchen for years, with the exception of one or two that are bi-annual or annual. These will happily grow in pots/tubs etc and are ideal for planting in our cupboards for veg boxes. We use a nursery that has been raising seedlings for us for many years, they are experts in their field and always send us top quality organic seedlings and plants. Our boxes really are a great way to get started and are designed for beginners and the more savvy gardener alike. When your kit arrives you simply go out and get busy planting and sowing. In one fail swoop you’ll have a fully packed kitchen garden! Challenges – the main problems that you could be faced with are the weather and predators such as slugs, snails, pigeons etc, and weeds. It can be a challenge but is usually hugely rewarding. There is nothing quite like going out to your garden to pick your supper, a few herbs and a bunch of flowers for the table. Think back to The Good Life! I am here to support and give advice to anyone who needs it. I will be writing regular blogs on all areas of gardening over the year so please make use of me and send me questions or comments. At this time of year every thing is pretty dormant in the garden, so it’s a great time to really have a look at the bones of your garden and work on making it a good environment for wildlife, hence promoting biodiversity. This is really important if you are going to garden organically. I have always bought the Guardian on Saturdays and for years enjoyed Christopher Lloyd’s articles on gardening. I was sad when he died and still miss reading his writings. 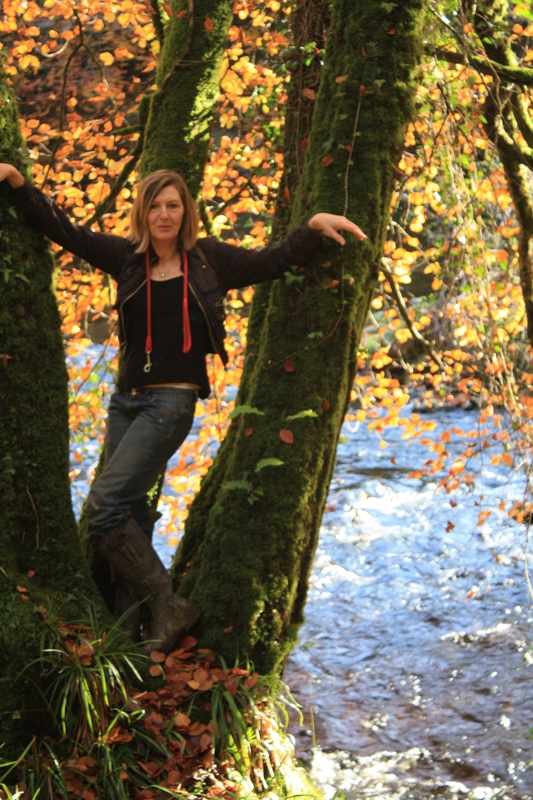 Alys Fowler has replaced him and I love her enthusiasm and promotion of permaculture and wildlife. Below I will give you some links to a couple of relevant articles written by her. 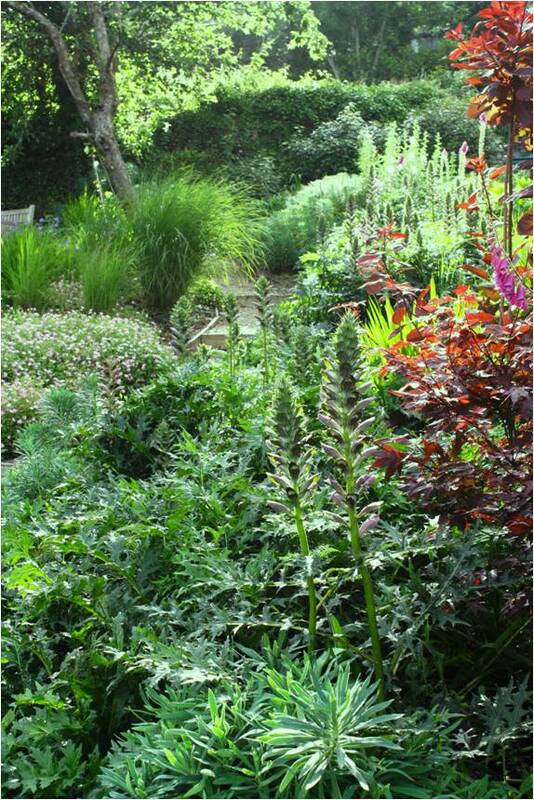 wild areas – create some wild areas in your garden. A few of logs left to rot, for instance, will encourage all sorts of insects, small mammals and amphibians. 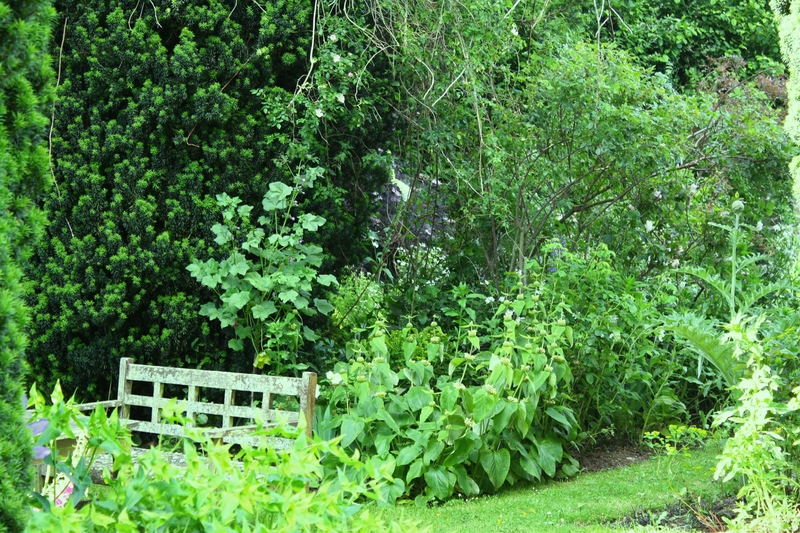 plant climbers along walls and borders of garden which will provide ideal nesting habitats. 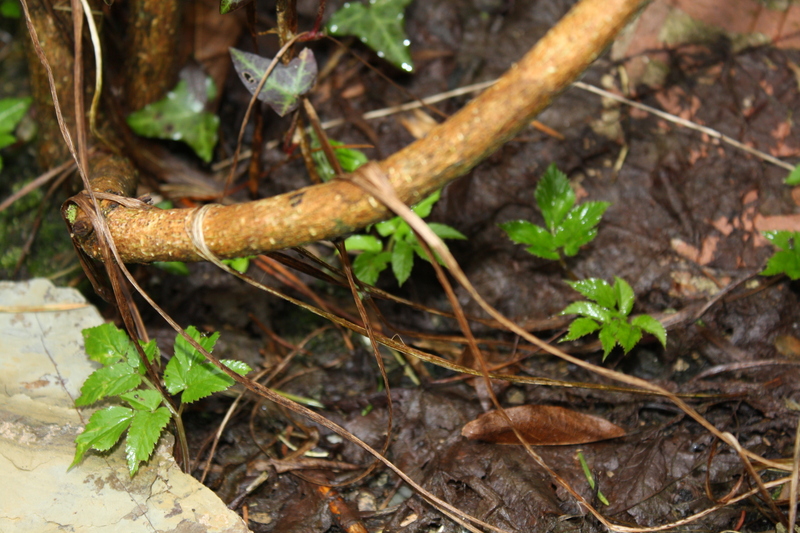 clear fallen leaves and debris from areas where bulbs are coming up. 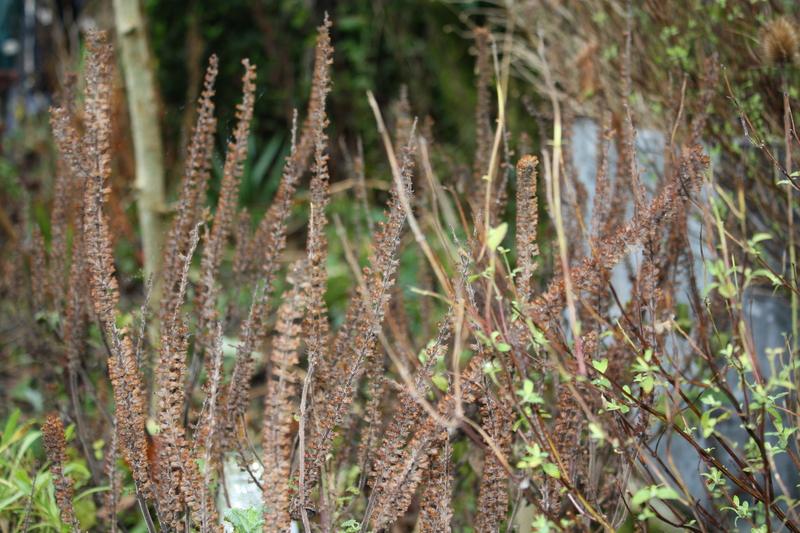 cut back last year’s growth on perennials, leaving any with seed heads still intact for birds and insects. Some people cut everything to the ground in the autumn and like everything neat, tidy and manicured. Personally I like to leave the dead growth up for as long as possible. 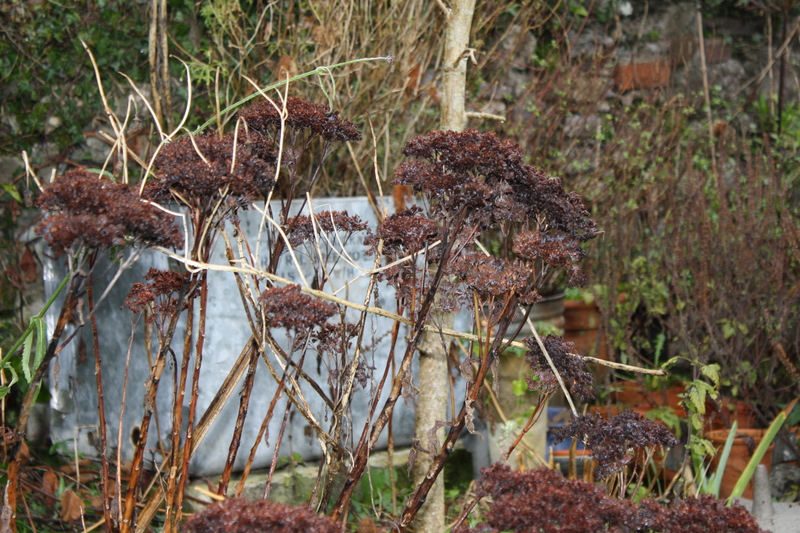 A lot of seed heads are really pretty and are also a perfect habitat and provide shelter for insects during the winter. Some growth looks awful and rots down into a nasty slimy pile like hemerocallis (day lilies) and agapanthus for example. This can go! 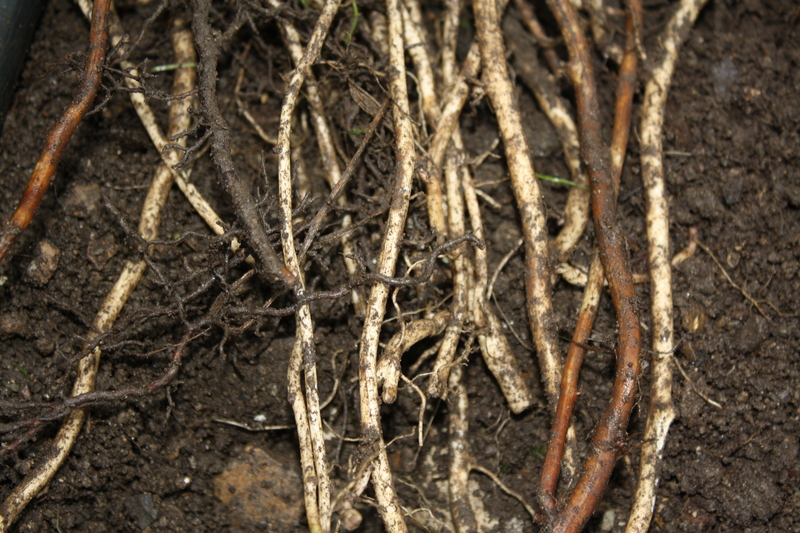 dig out perennial weeds such as dock, couch grass, brambles, buttercups and the like. thin out dead and diseased wood from established trees and shrubs. prune wisteria by cutting back shoots to 2nd or 3rd buds. Don’t be discouraged if you had a terrible year trying to grow vegetables last year. It was awful for everyone, amateurs and professionals alike. We cannot give up, we need to soldier on and adapt to the situation. Who knows what the weather will do this year, but I am ever hopeful for a better season ahead. plan your rotation for the year – the allium and brassica family are the ones to rotate. Alliums include onions, shallots and leeks and brassicas include cabbage, kale, cauliflowers, rocket and mustards. You should rotate these crops by giving a three year break before planting in the same area. This helps to reduce problems with onion rot in the allium family and club root in the brassica family. 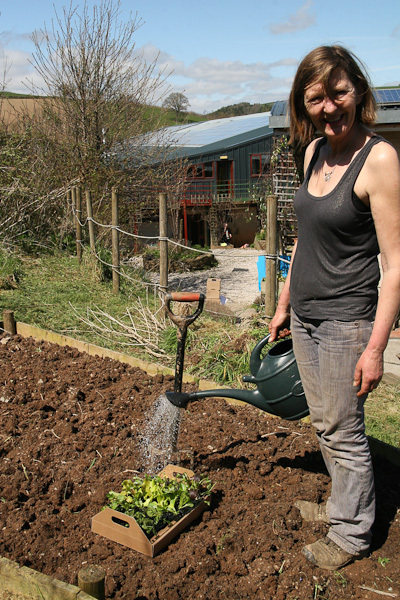 weed beds ready for onions and shallots – choose an area that is well drained and preferably was manured last autumn. Onion sets are now available to buy and can be planted from now on although some people like to wait for a month or so. sow broad beans for an early crop. order seeds or plants – look at what we are offering in our veg, flower and herb boxes to grow this year. 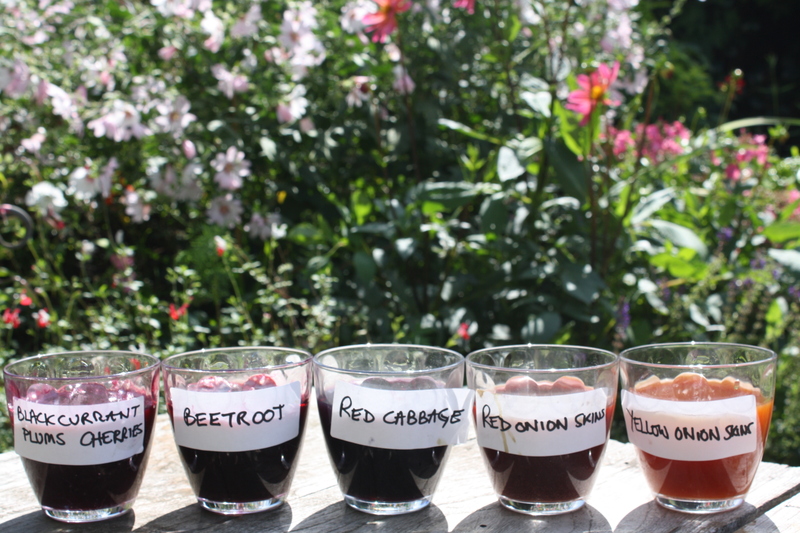 These kits are a fabulous way to get into gardening and grow your own veg, flowers and herbs. They come with plants, seedlings, seeds, full instructions and plenty of advice on how to grow your own produce. If you have any further questions or want advice on gardening feel free to comment or email help@www.riverford.co.uk/blog and I’ll be happy to help. There is nothing quite like going out in December and gathering some winter foliage to make a wreath for your front door. I do so a lot at this time of year as I make wreaths to sell through Riverford Farm Shop at Staverton, here in Devon. It really does make me feel very close to nature as I walk a hedgerow on a few friend’s farms looking for bits of black berried ivy, a few sprigs of bright red holly berries and some spindle berry if I am lucky. This mixed with some Christmas tree off-cuts, maybe a branch of yew or camellia in bud that you are trimming in your garden, or a few prunings from your apple tree covered in lichens, will make a pretty winter picture on your door. Suggested foliage: Evergreens such as holly, ivy, pittisporum, yew, eucalyptus, camellia, eleagnus, bay, some lichen covered twigs, old man’s beard, Christmas tree off cuts all make great plants to use. You don’t need all of these, three to five different types of foliages will be enough and about six to eight sprigs of colourful berries. What you need: String, secateurs, reel wire, wreath base, moss, and plenty of foliage and some berries for colour. You can buy wreath bases from a florist for a few pounds, or make use of an old wire coat hanger if you are feeling creative! Attaching moss to base: First attach the string to the base. Place a handful of moss onto the base and secure by winding the string around both the moss and the wire base. 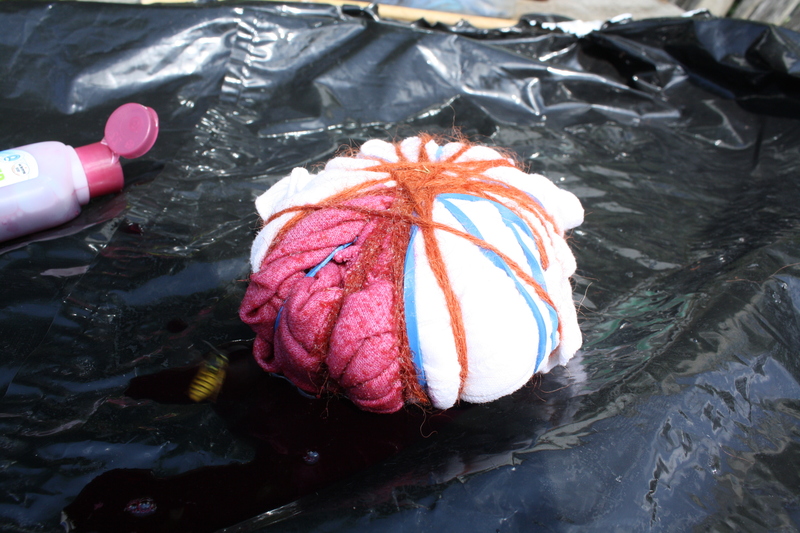 Continue to add more moss, winding the string around it until the whole base is covered. Tie off the string. 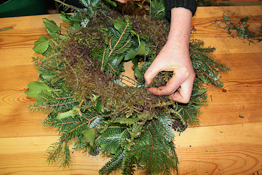 Starting the wreath: Now attach the reel wire to the mossed up base – tie one end of the wire to the base wire using a knot, then leave the wire reel attached ready to wind around each bunch of foliage as you go. Make another bunch and place this on the stems of the last bunch and secure again by winding round the wire. Keep an eye on the shape and composition as you go along. Finishing the wreath: When you have covered the whole wreath, tuck the last bunch of foliage stalks right under the first bunch of foliage leaves to complete the circle seamlessly. Turn the wreath over and secure the wire onto the base and tie off. Make a loop with a piece of string (or wire) and attach it to the base of the wreath to act as a hanger. Attach to door: Use the hanger to attach the wreath easily to your front door. Caring for your wreath: Ideally a wreath should be placed on the outside of a door. This chilly position will ensure the wreath looks good for a few weeks. Spraying it with a fine mister would also help it stay looking fresh. The leaves this autumn are spectacular. I don’t know about any of you, but I have a tendency to get a bit down towards the end of September. The nights drawing in, everything coming to an end in the garden and the thought of a long, cold, damp winter fills me with dread, gloom and doom. But once the leaves have turned I force myself out of my sorry state of mind and there is nothing more cheery than a good walk in the local woods. 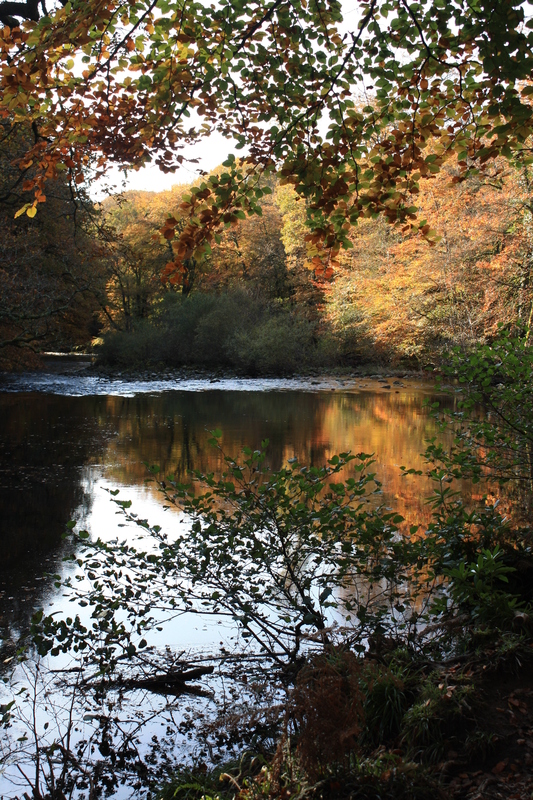 I am lucky enough to live close to Hembury Woods, which skirt the River Dart and is full of many ancient trees. It is predominantly a western oak woodland with a wet alder wood in the valley. There are plenty of silver birch, beech, holly and hazel. The colours alone are so uplifting that the experience of walking amongst these trees really gets me into the spirit of autumn and winter, hot fires and chestnuts, big scarves, thick socks, woolly hats and all those sorts of things. My point is there are lots of leaves falling off the trees at this time of year. Raking them up is a good idea and why not make some leaf mould which makes a great soil conditioner when left to rot over the winter and ready for the summer. You don’t want to put leaves onto your compost heap as they are slow to rot down. If you have space, make a separate heap for leaves alone or otherwise a put them in a black plastic sack with holes punched in the bottom. Some folk rake all the leaves onto the lawn first and then mow them up, which chops them up a bit. You can mix them with some lawn cuttings too to help speed up the rotting process a little. Either way is fine. Put the leaves in heavy duty black bags. Once filled, pierce the bottom of the sacks and put them in a corner out of the way and by next summer you should have some good leaf mould. This is a great low nutrient soil conditioner and can be spread onto your flower or vegetable beds or added to pots and tubs. It will improve the structure of your soil. I am going to give you tips on putting your gardens to bed for the winter and what you can do in your kitchen gardens to prepare for next year. I will also make suggestions on things to plant now for a spring display. Oops, it’s been over a month since I wrote my last blog so I apologize for this lapse and all I can say is that I have been far too busy working and also having a jolly good time too. 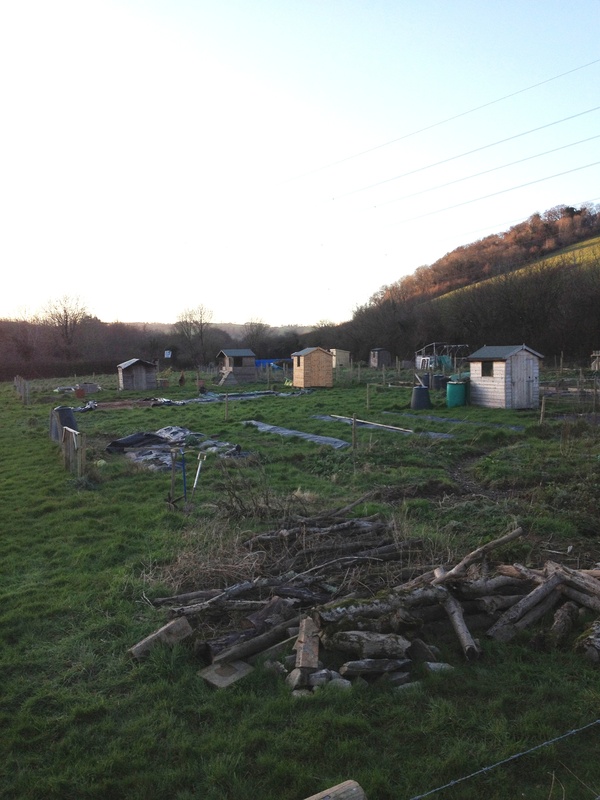 So before I launch into gardening tips, photos etc, a little bit about …. Meeting a charming man with a v, v, gsoh from Ottery st Mary, called Sebastian, who took me on a midnight walk and showed me the maze on the estate. Unfortunately I lost him on the dance floor later on (or maybe he suddenly got the fear and did a runner, poor thing!!). Anyway, whatever hey! So thank you Sebastian from Ottery, your tour has made me think about mazes in a completely new light and maybe sometime I will write a blog dedicated to them alone. So much fun has been had. Now back to work…. 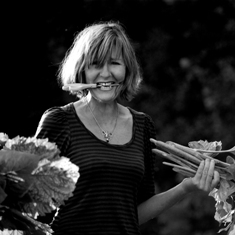 As you know I am an organic flower grower (as well as a gardener, a gardening blogger and a Riverford Farm Tour guide). The terrible weather we have had this season has made life very difficult for anyone attempting to grow anything. I can’t remember worse conditions for all the years I have been a grower. Over the last couple of months my flowers have finally started producing beautiful blooms which need regular cutting, conditioning, bunching and delivering to Riverford’s Field Kitchen restaurant, Riverford Farm Shop and to various parties and weddings that have booked me. So, my life is quite hectic as you can imagine. It is best to crop your flowers either first thing in the morning, before it gets too hot, or later in the evening when its cooling down. If you cut them in the midday sun they will wilt before you get a chance to put them in water. Always cut your flowers at an angle, allowing a bigger surface area to take up water. The first flowers such as Cosmos, Rudbeckia or sundflowers for instance, may be fairly short. Cut the central flower to some lower side shoot. These will lengthen and so your next stems should be longer. Put them in a bucket of water in the shade and give them a drink. Some flowers will wilt unless you condition them. Euphorbias are a classic example. The milky sap that is produced when you cut them blocks the stems and stops the water from being taken up. It is also highly allergic. The answer is to sear the stem ends in hot boiled water for twenty seconds, then refresh them in cold water again. This method is useful and worth a try with any wilting flowers. All the leaves that are going to be below the water line of your vase must be stripped off. If you don’t do this the leaves start to rot in the water, the water becomes rather a smelly bacterial soup and will shorten the life of your flowers. Refreshing the water every day or two will also help you get a longer life out of your flowers. 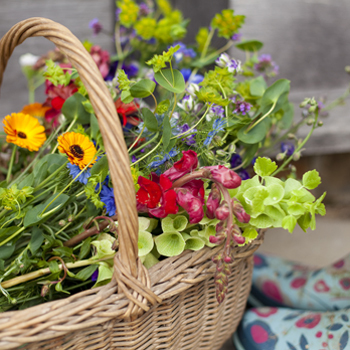 Regular picking is essential if you want your flowers to carry on producing. If you leave them to go to seed the plant will think that this is what you want and put all its energy into producing seeds rather than flowers. 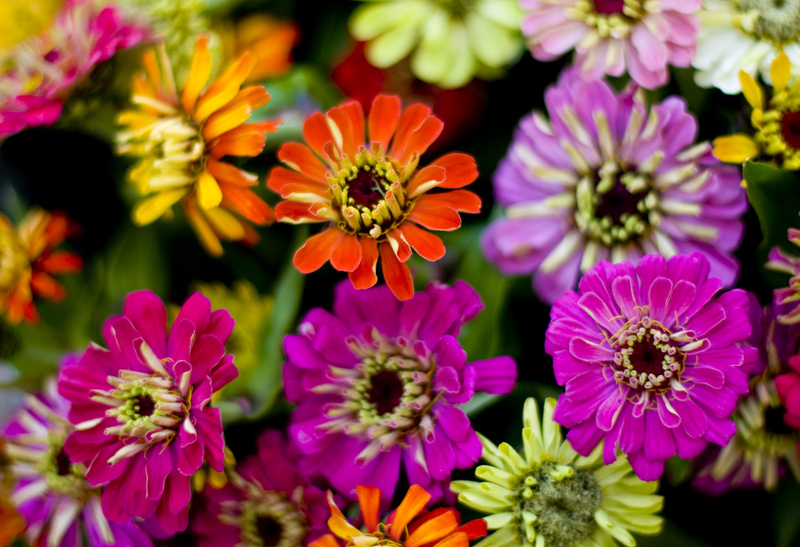 Dead head flowering plants such as Dahlias and Cosmos to encourage more flower production. Cut back any perennials and annuals that are over and looking messy, being mindful about leaving those seed heads that are strong enough to withstand the wet rain and wind. These can look fabulous in winter when Jack Frost visits and covers them in a layer of sparkly, diamonté like crystals. Feed any container grown plants. I have a patio full of pots, tanks and old metal baths. I plant these up in May with pelargoniums, scented geraniums, morning glory, salvia and all sorts. Any thing grown in pots will need a good feed every couple of weeks to keep them healthy and looking good through out the season. 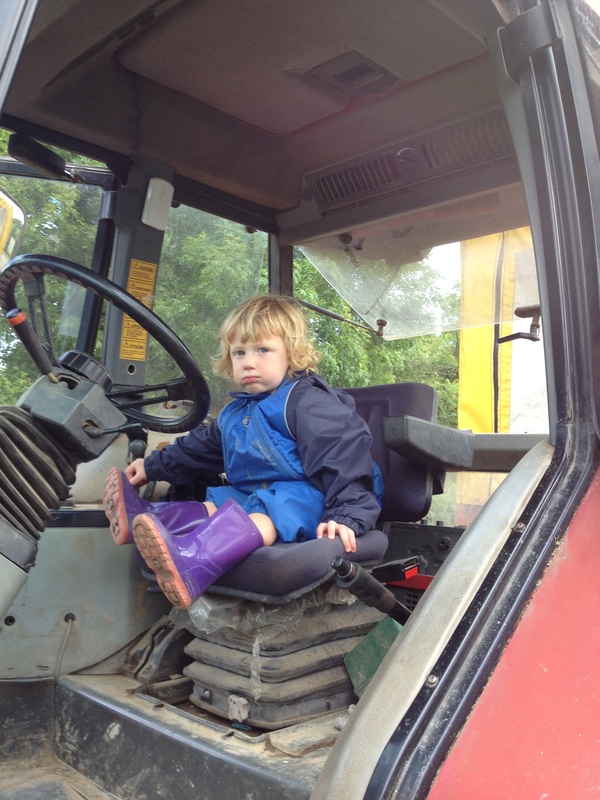 Benji was clearly not that interested in the statistics I was giving them on the tomato crops and yields etc and was just champing at the bit to get back to the tractor, which is so obviously his passion at the mo. I love the fact that he really does look like a proper grumpy Devon farmer who is really hacked off with the awful weather we’ve been subjected to this season. I’ll also be writing about the Herb Garden in front of the Riverford Field Kitchen which I designed and planted up over seven years ago. It’s worth a whole blog on it’s own too. 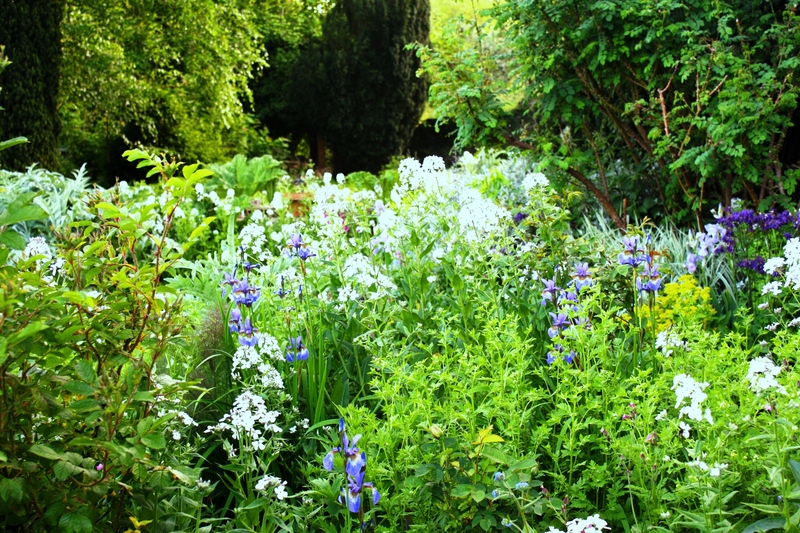 I also have more stunning photos of plants and planting combinations in my own garden and some gardens I tend and look after, to share with you and inspire you. Here’s are a couple of pics below, keep following my blogs for more. In today’s blog I will briefly touch on the weather, cheer you up with some garden photos, give you tips on prolonging your garden’s good looks and suggestions for plants to use for this. I have nothing to say. 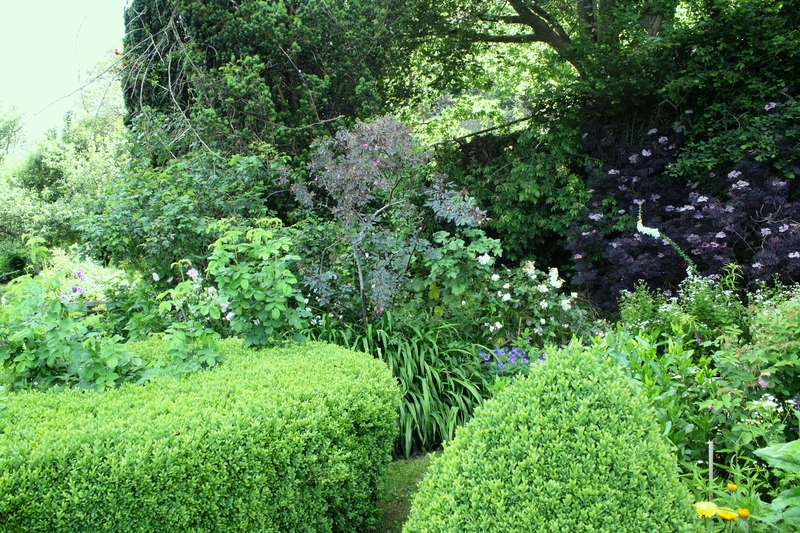 It’s boring and relentless and I am sick to my dwindling top teeth of moaning about it… so, in a cup half full (or actually overflowing) sort of approach, the continual onslaught of rain has been jolly good for our shrubs, trees and perennials. They are loving it. After a pretty dry couple of years, I have observed these plants lapping it up. Everything has shot up to its full height and more. This season, I’ve seen Delphiniums as tall as me (just under six foot). Last year they were more like four and a half feet tall. The rain can damage this growth, weighing it down and with a little wind can cause havoc, so staking is essential in these circumstances. For the last couple of weeks I have been stripping out and cutting back various plants that are over, to make space for plants that will flower over the next few months. In the garden pictured below we let campions, forget me nots, feverfews, valerian officinalis, comfreys, euphorbias and sweet rockets seed freely. In the following year they will give a great early summer show and when inter-planted with other perennials, roses, shrubs etc they give a really natural look. Nicotiana Sensation: A lovely scented mix of pinks, purples and whites. Nicotiana lime green are fabulous and look great next to bright pinks, reds and orange plants. Nicotiana affinnis are white and the most heavily scented. 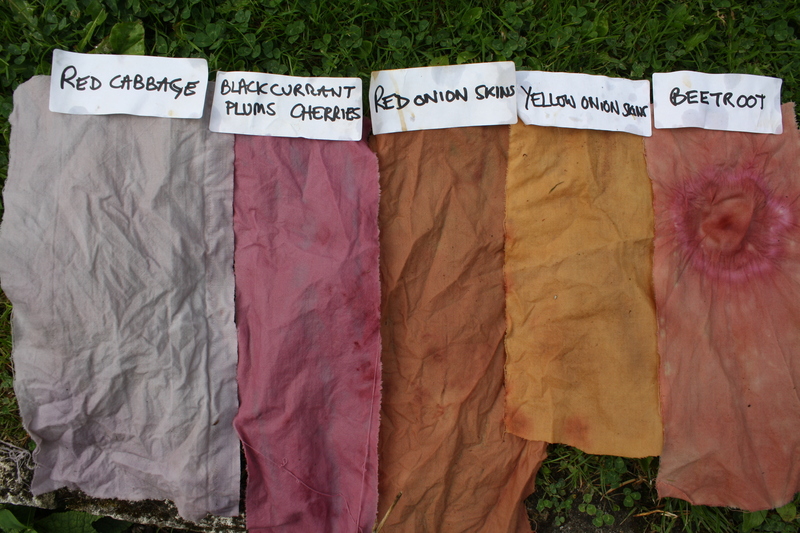 Having sowed these a little later than usual I am now inter-planting them in gaps I have created. They look fabulous and scent the whole garden especially in the evening. Nicotiana mutabilis grows to a statuesque 3-4 foot and have a strange but pleasant sort of bubble gum fragrance. Cosmos: Another annual fave of mine and if picked regularly, will carry on flowering til the first autumn frosts. I love the various bright pinks and whites of nicotiana ‘sensation mixed’ but also think ‘candy stripe’ a beautiful variety, pale pinks with a white stripe. Dahlias: I have been rather worried about myself the last few years as I have taken to liking dahlias, after being really rather snobby about them for the last 25 years!! What is going on? Maybe it’s an age thing and the next step will be carnations. God forbid! The thing is, they really are a fantastic late flowerer and more often than not will perform for many years if the tubers don’t rot over winter. 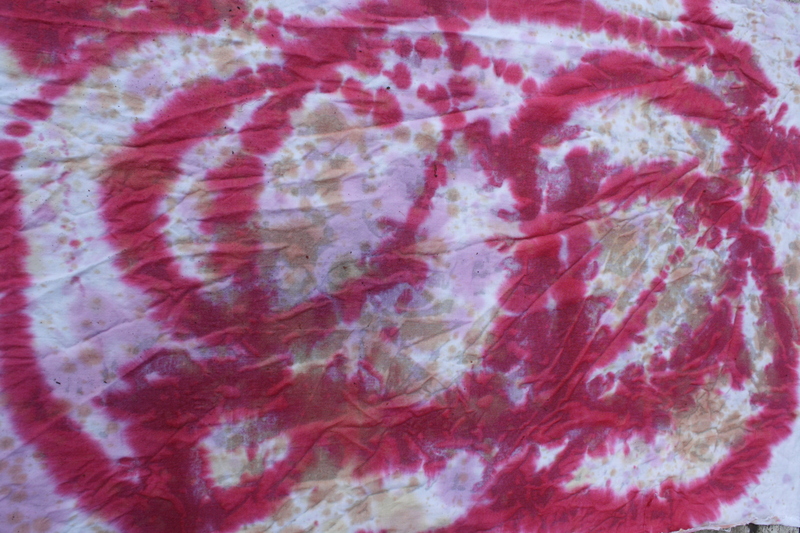 They come in all sorts of colours and shapes and sizes. My favourites are the deep pinks, maroons and reds and planted up with some lime green nicotianas in front, well all I can say is, its heaven. 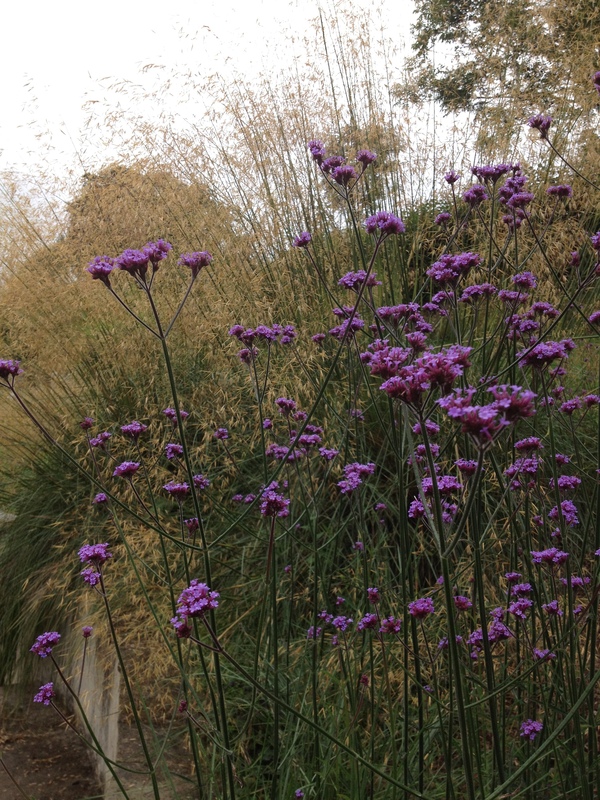 Verbena bonariensis: Another late flowering perennial I love. Its little purple flowers sit on top of long see-through stems and I plant lots of this in any gaps available. Strobilanthes atropurpurea: An excellent perennial that grows to just over a metre, this plant freely bears curved and hooded indigo blue or purple flowers above a mound of leafy stems in late summer. It’s not that commonly grown, but I found it at our local plant nursery, Hill House Nursery in Landscove (www.hillhousenursery.co.uk ). 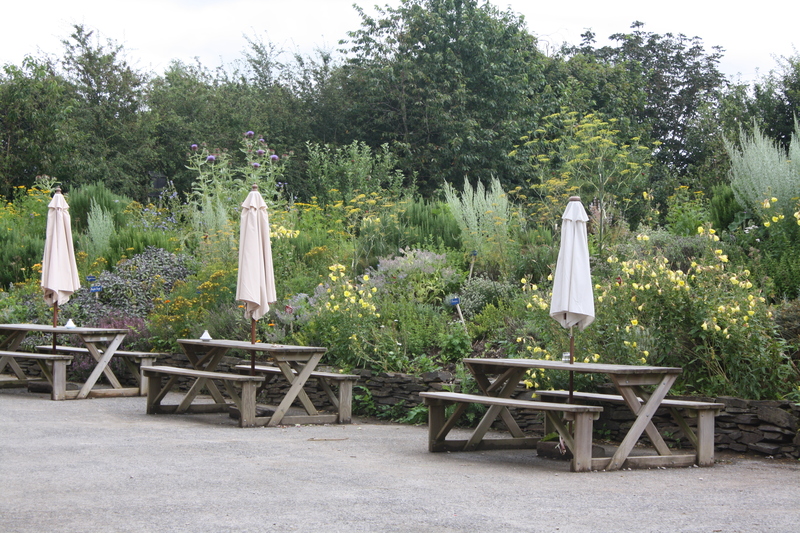 This nursery run by Ray, and his son Matthew, is an amazing place to visit with a great café and lovely gardens. 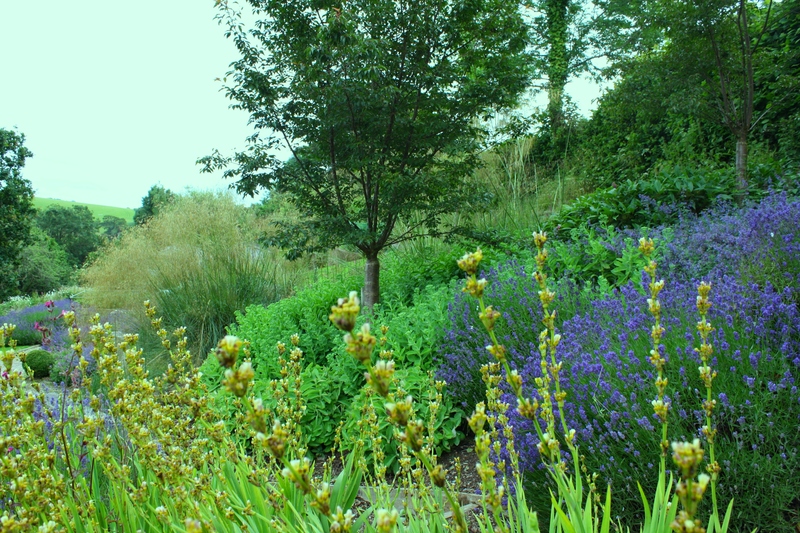 It has a classy selection of trees, shrubs, roses, perennials, annuals, herbs, geraniums and well…. I could go on and on. The great thing about Hill House Nursery is the staff have excellent plant knowledge and are very helpful, and they stock many plants you will rarely see in most garden centres. I believe they have an online shop too. Its worth a visit if you are in the area. 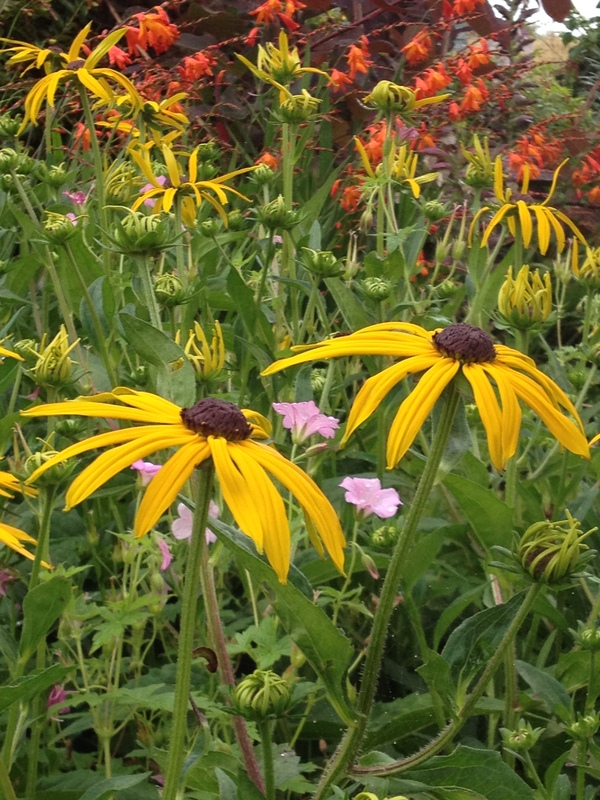 Some other perennials to consider for a later performance are Rudbeckia, Helenium, Michaelmas daisies, Japanese anemones and Sedum.